Exploring volcanic landscapes has become a fairly frequent pastime during our travels, from Idaho’s Craters of the Moon to the Big Island’s Mauna Kea. All of these places have their own starkly desolate beauty, and Greece’s Nea Kameni is no exception. Visible from Santorini, the uninhabited volcanic island looks like a black mass. Up close, its nuances come into focus. Nea Kameni was the first stop on a daylong sailing trip we took in the waters around Santorini. 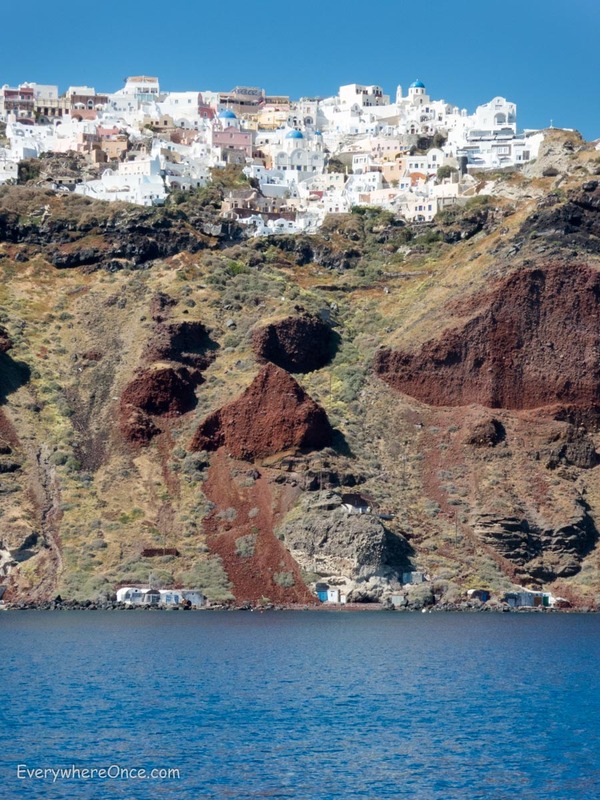 After a short ride from Fira’s harbor, our wooden boat—reminiscent of one long-ago pirates might have manned—pulled up to Nea Kameni and moored alongside piles of ebony-colored rubble. The higher we climbed, the better and more expansive the views. At the pinnacle, where the trail continues around the rim of the crater, we drank in the scenery. 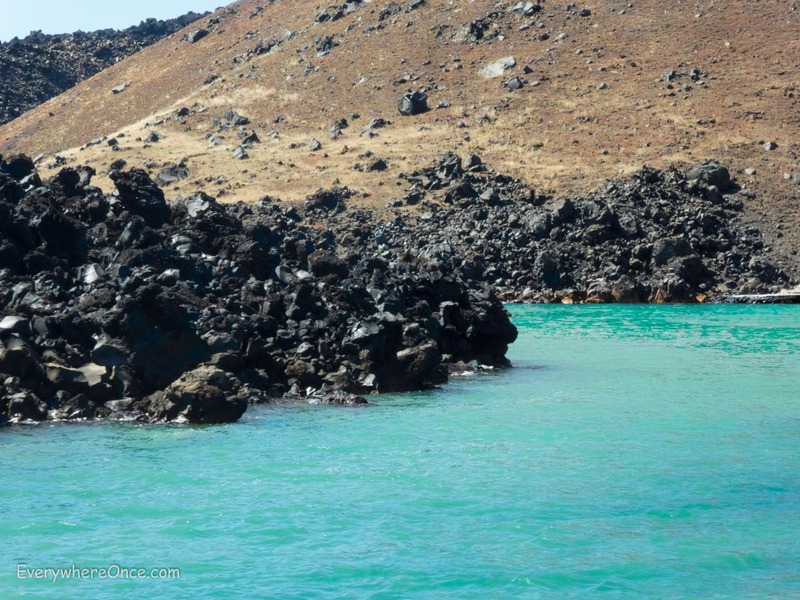 What sets Nea Kameni apart from the other volcanic landscapes we’ve experienced is the setting. Rather than standing in an expansive lava field where dark, hardened magma stretches far and wide, here at the summit of this two-kilometer-wide island you can marvel at the vividly blue Aegean all around. After a brief stop at some hot springs, our next port of call was the island of Thirasia. More energetic people than us used their time to explore the clifftop town, reached on foot via a hardy walk or by paying to let a donkey do the hard work. Having just climbed a crater we had no interest in either walking up ourselves, nor did we want to burden the animals with our bulk. 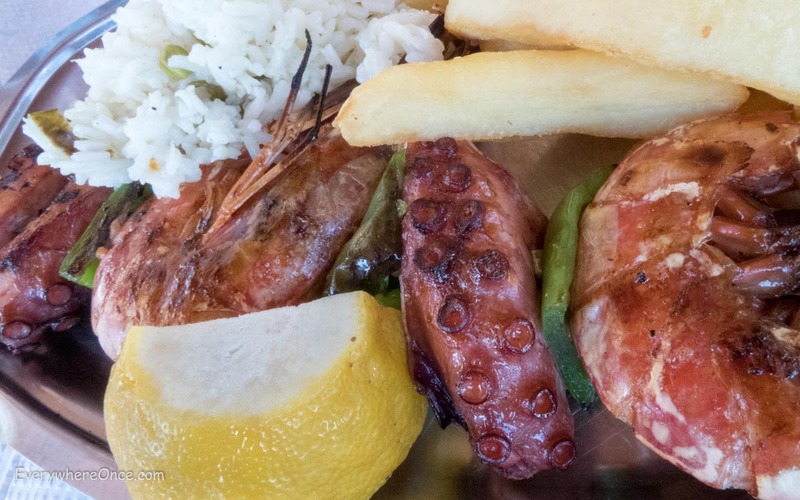 Instead we had a leisurely lunch at a waterside restaurant, where grilled octopus was on the menu. 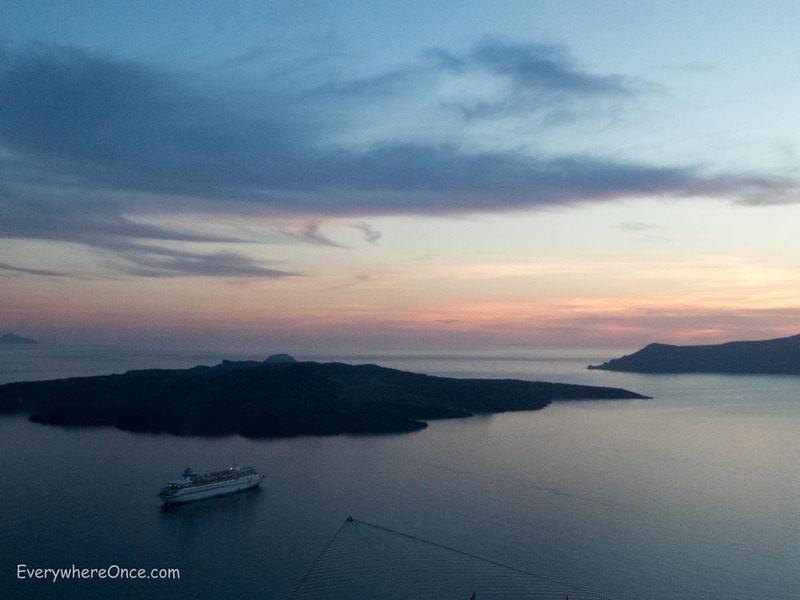 Our route back to port took us from Oia to Fira along the same five-mile stretch that we had hiked a couple of days earlier—giving us a completely different perspective on Santorini’s splendor. Enjoyed this immensely, especially the photographs which are so different to those we usually see of Santorini. I had no idea ‘the other side’ was like this. We didn’t know this part of the Greek islands existed! So cool. Hope to go there on one of our expeditions someday. Those are some stunning views. My fiance is Greek and keeps telling me she wants to take a trip to Greece some day.